From classic cake or glazed, to uniquely crafted and over-the-top, the doughnuts in Colorado will please any and all doughnut lovers. The best shops in the state vary in menu slightly, from your casual classics to cool concoctions. These sweet treats will make any morning a happy one in the Centennial State. Find the perfect doughnut at these 10 best doughnut shops in Colorado. If you’re looking for something outside of your average doughnut realm, then Glazed and Confuzed Donuts is the place to go. Fresh and local ingredients are used to create these wacky and unique doughnut concoctions. From a mojito doughnut to a maple and bacon glazed treat to even a root beer float doughnut, all your strange and unusual doughnut dreams will come true at this Denver doughnut shop. If you don’t find something you love the first time you visit, there is always a new featured doughnut every single day. Even those who are vegan and eat gluten free will find something to binge on at Glazed and Confuzed. With over 50 different and oddly unique doughnuts to choose from Voodoo Doughnut in Denver, you’re sure to gain a few pounds with these mouthwatering and utterly sweet dough creations. Find doughnuts topped with candy, cereal or your favorite ice cream topping at this doughnut shop that is open 24 hours a day. Don’t leave without getting the Voodoo Doll doughnut, which is a human-shaped doughnut with chocolate frosting, stuffed with raspberry jelly and completed with a pretzel stuck through the heart. LaMar’s has been making incredible doughnuts since 1933. Although it’s not a Colorado native business, LaMar’s has numerous locations due to its popularity in the Centennial State. Find your classic doughnuts here but always expect a quickly-moving line out the door on weekends. Find handmade doughnuts hot and fresh at The Donut House, which has three locations in Colorado. No matter if you are a cake doughnut fan or raised and fried doughnut fanatic, The Donut House will serve you an incredible doughnut to your liking. This family-owned doughnut shop makes a great cinnamon sugar doughnut but the traditional glazed doughnut will always be a customer favorite. 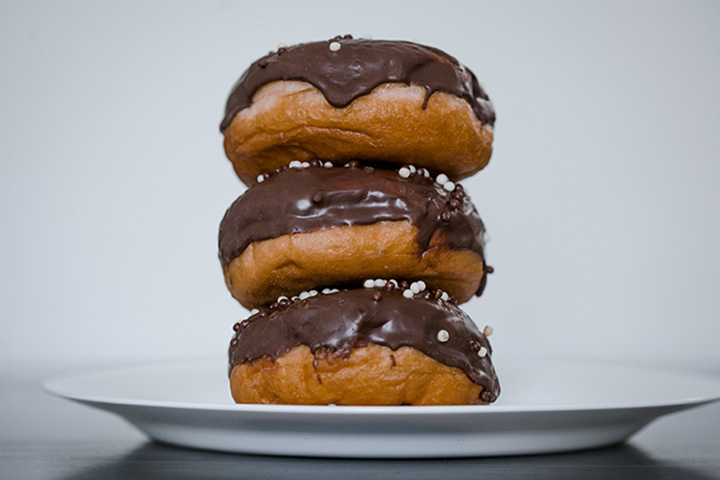 For a doughnut creation that is truly your own, head to Fractured Prune Doughnuts. You can choose from over a dozen glazes and toppings to complete your fresh and hot doughnut treat. Although this shop is a national chain, Denverites can’t resist these DIY doughnuts. A made-to-order doughnut topped with things that are uniquely catered to taste is what gives Fractured Prune a spot on this list. For those who just can’t decide between all the options, try the O.C. Sand complete with a honey glaze and cinnamon sugar. Get a hand-crafted doughnut created with high quality ingredients at Yummy’s Donut House. This Lakewood shop draws customers in with nothing but classic doughnuts. Yummy’s doesn’t need weird toppings to satisfy taste buds. Grab a plain glazed that is sure to be soft and fluffy. You truly can’t eat just one. Donut Maker, a locally-owned shop since 1988, has your classic doughnut selection as well as caters to custom orders. Both original and cake doughnuts can be found here along with doughnut rolls, crullers and filled doughnuts known as bismarcks. For those seeking a unique treat, try the cookies and cream doughnut or even a Nutella-stuffed creation. Find your classic doughnuts, cake doughnuts, bismarcks and doughnut holes at Donut Haus. Tourists and locals alike enjoy the sweet breakfast at Donut Haus because it's a great pit stop before heading to Rocky Mountain National Park in Estes Park. You can find more than your average doughnut here through the daily specials. The “pinecone” doughnuts however are a unique creation. These doughy treats are shaped like a ponderosa pinecone. Expect a gorgeous display of dozens of doughnuts at Amy’s Donuts. Choose from perfectly crafted classics to decorated eye-poppers like Amy’s Almond Joy doughnut or Dirty Worms doughnut with gummy worms. With so many varieties, everyone in the family is sure to get something to soothe their sweet tooth. Jelly Cafe, a trendy cafe with multiple locations in Denver, serves up homemade doughnut bites that come in eight flavors. The menu is larger than just doughnuts but these well-crafted doughnut holes are still some of the best in Colorado. The doughnuts range from unique concoctions to a classic jelly-filled. The maple bacon is a crowd pleaser while the Bhakti Chai is a creative treat.